I must confess I was a total newbie to Qantas domestic business class before this flight but with the new 'anyseat awards' that Qantas Frequent Flyer offers which include status credits I decided to give it a go. Was I impressed? Not particularly... However it wasn't all bad! I had no check-in bag so I simply went to the kiosk to print off the boarding pass. This can also be done after security at the Qantas Club entrance (no need to be flying in Australia to go to domestic airside). I had already checked in online but did not print a boarding pass at home, the machine promptly printed off my boarding pass for this leg, and the connecting flight to Hobart. I noticed the boarding time indicated we would commence boarding 25 minutes after the scheduled departure time. Sure enough, a quick check on the Flight Information Display showed my flight was delayed 45 minutes today. Never mind, I had a long connection in Sydney and would have a more leisurely breakfast in the domestic business class lounge. There was a priority security queue for business class and Qantas elite frequent flyers, but no proof was being asked for. The queue was shared by crew and staff going airside. Thankfully the line was short and I was upstairs to the lounge in no time. Qantas have both a 'Qantas Club' and a 'Domestic Business' lounge. The first is for Qantas Club paid members, Qantas Gold card holders and Oneworld Sapphire members. The business lounge is for Qantas Platinum card holders and anyone with a business class boarding pass. I waved my Business boarding pass at the lounge attendant (talking on a phone at the time) and she waved me in to the right hand side door. Once in the lounge I found a lovely spot overlooking the Qantaslink regional apron. Brisbane Domestic Business Lounge - my seat, nice view! We Australians (like many people) absolutely love our morning coffee. 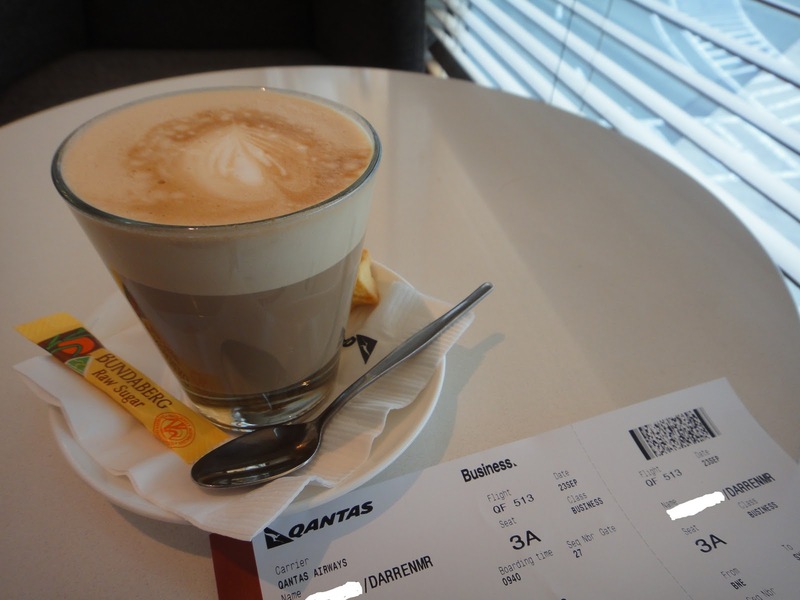 The latte seems to be the drink of choice these days and fortunately Qantas provide a barista to whip up your favourite drink during the morning hours. There is no alcohol service until 12 noon, so I grabbed a latte, and it was pretty good! morning Latte #1 - a little frothy but very nice! Feeling a little more perked up it was time for a spot of breakfast. The food options are fairly limited, certainly no bacon and eggs here but I ended up feeling pretty satisfied with some raisin toast, bircher muesli and orange juice. After another latte and a read of the newspaper it was nearing our amended boarding time so I decided to leave the comfortable surrounds of the lounge and head to the gate where I found VH-OGO, a 16 year old Boeing 767-300ER had just arrived and was preparing for our flight. I personally really enjoy flying on Boeing 767s, they are nice and comfortable on these short domestic runs even if they are starting to show their age. I took quite a few snaps and went back to the gate area where boarding had just been announced. There was no queue for premium passengers so I waited with everyone else for my turn. This aircraft was fitted with Qantas' standard domestic business class seats in a 2x2x2 arrangement. I found it perfectly adequate for a flight of this length. The seats were comfortable and feature leg rests and a reasonable amount of recline. Entertainment options are limited to the audio channels as well as the overhead screen programming (usually the morning or afternoon news update or other short programs). The headsets provided were standard and the same as economy class. Soon after I took my seat I was offered a welcome drink, apple juice. Todays flight was just under half full in business class with 14 passengers out of 30. I was fortunate enough to have the seat beside me empty. Boarding finished pretty quickly and moments later the doors were closed and pushback commenced. Whilst pushing back the Qantas safety video was played. Glasses were then collected and as we taxi'ed out one of the pilots made an announcement and apologised for the delay. Moments later we lined up on Runway 19 and took off into the cloudy sky. climbing out we see the Brisbane River to our left. Once the crew were up and about they quickly came around with a refreshing hot towel. Since today's flight was mid morning it was simply a 'refreshment' service. However I believe Qantas do promote a 'hot' option on all flights for business class. Today's choice was a hot bacon and leek quiche, or yoghurt and fruits. I took the hot option. The drinks on the trolley were only non-alcoholic but alcohol was available on request. I went for the sparkling which is the Yarra Burn australian sparkling, and not particularly good! During the meal service the crew came around with some warmed pastries, I took an apple danish, which was really tasty. Soon after I finished my danish one of the crew came around with more danish so I decided to indulge and have another! By this stage my drink was empty and another bottle (piccolo) was immediately offered. I was fairly impressed so far by the service. Smiling from the alcohol and a full stomach we commenced our descent into a cloudy Sydney. We would be landing to the south and the captain informed those on the left side we would have a great view of Sydney city as we popped out of the cloud base. We made a smooth touchdown on Runway 16L which meant a long taxi back to the terminal! Well it was only a 70 minute flight in the air but it was certainly the most comfortable 70 minutes I have spent on a domestic flight within Australia. The service was very good, the seats were decent and the food was alright. Next up, it's the Sydney lounge and another Qantas domestic business flight to Hobart, this time on a Boeing 737-800.